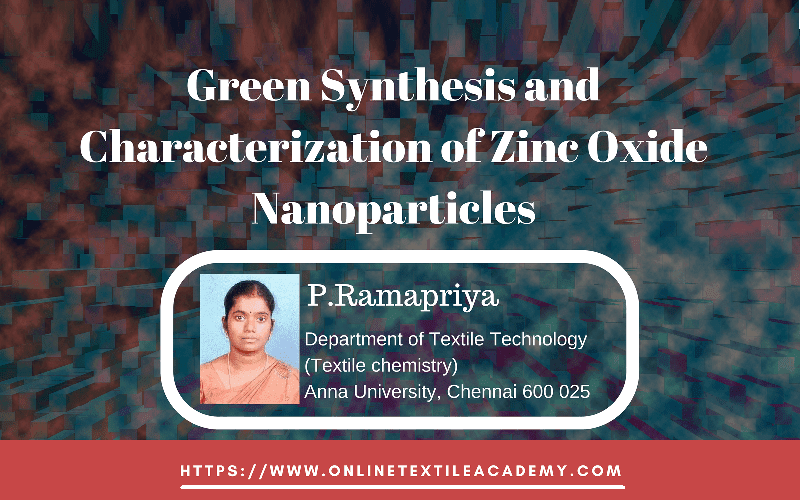 The synthesis and characterization of Nanosized Zinc Oxides particles and their application on the cotton fabric have been studied for the protection against UV- radiation and antibacterial activity. The effectiveness of the treatment of Green synthesis of ZnO nanoparticles by Vicoa Indica leaf extract treated on cotton fabrics .As prepared and green synthesized ZnO structure morphology changed by calcined at three different temperatures with three different plant concentration [2g: 100 degree Celsius, 4g: 300 degree Celsius and 6g: 600 degree Celsius]. This paper mainly focuses on how to ZnO structure morphology influence in textile and antibacterial activities. This three different calcined ZnO Nanoparticles structure morphology analyzed by scanning electron microscopy (SEM) and transmission electron microscopy (TEM), crystallites analyzed by X-ray diffraction (XRD), particle size analyzed by particle analyzer. The three different temperature calcined ZnO nanoparticles coated on cotton fabric and subjected to UV protection and antibacterial studies. The green synthesis methods working for the synthesis of metal oxide nanoparticles through organic solvents and toxic reducing and chelating agents, thereby intimidating the environment and most of the nanoparticles applications in biomedical, biotechnological, environmental, biological, and some industrial areas. Thus, the use of proper and biocompatible processes for the preparation of metal oxide nanoparticles has expected significant attention. Plant extracts approached the green synthesis of nanoparticles is one the cleanest, biocompatible, nontoxic and eco-friendly methods through large-scale production. Polyol components present in plant extracts act as chelating and capping agents for rapid biosynthesis of nanoparticles and stabilize the metallic nanoparticles formed. The majority of review report exposed that most studies have reported on the synthesis of metal and metal oxide nanoparticles such as silver, ferric, copper oxide, gold, copper, Palladium, etc. through a green route synthesis. The contribution of zinc oxide (ZnO) nanoparticles currently used in several areas. Particularly textile industry and antimicrobial activities in significantly. The ZnO nanoparticles coated fabric, protection of the body against solar radiation, bacterial action and for other technological application. The ZnO is currently as an antibacterial agent against both Gram-negative microorganisms like E.coli and Gram-positive microorganisms like staphy lococus aurevs in microscale and nanoscale formation. Vicoa indica leaves are a common weed that belongs to the family Euphorbiaceae. The leaves are evaluated for their wound healing activity in pets .Textile goods, especially those made from natural fibers; provide an excellent environment for microorganisms to grow, because of their large surface area and ability to retain moisture. Most textile materials currently used in hospitals and hotels are known to cause cross-infection or transmission of diseases caused by microorganisms. There are various chemical and physical methods that can be considered for the production of antimicrobial fabrics. Antimicrobials are used as bacteriostatic, bactericidal, fungistatic, or fungicidal, and offer special protection against various forms of textile rotting. The objective of the present work was a green synthesis of ZnO nanoparticles by Vicoa indica leaf extract. As prepared ZnO was calcined at three different temperatures [2g: 100, 4g: 300 and 6g: 600 degree Celsius]. This paper mainly focuses on how to ZnO structure morphology influence in textile and antibacterial activities. This three different calcined ZnO nanoparticles structure morphology analyzed by SEM and TEM, crystallites analyzed by XRD, particle size analyzed by particle analyzer. The three different temperature calcined ZnO nanoparticles coated on cotton fabric and subjected to UV protection and antibacterial studies. Fresh leaves of Vicoa indica were collected from in and around Tiruchengode, Tamil Nadu, and India. The collected leaves are washed twice with tap water followed by washed with Double distilled water at multiple times to remove dust from the surface of the leaves. Washed leaves are shade-dried for 15 days. Well dried Vicoa indica leaf was Ball milling at 15 h and finally got very fine leaf powder. Leaf extracted prepared by 2 g fine powder in 100 ml double distilled water and well stirred with 70 degree Celsius maintained at 2 h. This mixer was cooled to room temperature and leaf extracted separately filtered by Whatman (No. 3) filter paper. This leaf extracted used as a catalyst for synthesis of ZnO nanoparticles without another chemical. The prepared 50 ml A. indica leaf extract poured in 0.5 g zinc acetate with stirring at 60 degree Celsius 1 h occurring ZnO precipitated. The obtained precipitated was washed with double distilled water several time finally heated in a hot air oven at 80 degree Celsius for 24 h. Obtained ZnO nanopowders calcined at three different temperature (100, 300 and 600 degree Celsius ). This powders allowed for the following the investigation. The XRD pattern of three (2:100, 4:300 and 6:600 degree Celsius ) prepared ZnO nanoparticles were obtained using Philips X’pert MPD powder diffractometer (X’Pert PRO, PANalytical, the Netherlands) operated with the long fine focus of Cu anode at 40 KV and 30 mA in Bragg-Brentano geometry. The XRD patterns were obtained in the 2θ range from 10º to 80º in a step-scan mode with a 2θ step size of 0.02º. The constituents of elements in the prepared ZnO nanoparticles were identified using X-ray fluorescence spectrometer (EDX-720; Shimadzu, Japan). The UV-visible spectra of the prepared ZnO nanoparticles were recorded employing UV-visible spectrophotometer (Cary 8454, Agilent, Singapore) operating in the UV to near IR (180 – 800 nm) spectral regions. The sample for analysis was prepared by diluting 0.1mL of the sample in a cuvette to 2mL using deionized water. The same procedure was employed to record the spectra for all samples. The particle size distribution was determined using a dynamic light scattering (DLS) technique with a sub-micrometer particle size analyzer (Nanophox, Sympatec, Germany). The particle size of all samples was measured in the range of 1-1000 nm at a scattering angle of 90 degrees. All prepared ZnO nanoparticles were analyzed using a scanning electron microscope coupled with energy-dispersive X-ray analysis (JSM 6360; JEOL, Japan) to identify the morphology, microstructure, and elemental composition of the prepared samples. Grain size and surface morphology of ZnO nanoparticles were scans through transmission electron microscopy (TEM, CM200; Philips, Eindhoven, The Netherlands) operated at a potential of 120 kV. The average particle size and diffraction pattern of the ZnO nanoparticles were refined. 1 g chitosan was dissolved in 1 M acetic acid and under string for 12 h. 100 degree Celsius calcined ZnO nanoparticles (2g) mixed with the chitosan solution. This mixture was stirring in 1 h and 30 min sonicated after the stirring. The nanocomposites coated on cotton woven fabric (plain weave 138.84 grams per sq., 116 ends per inch, picks per inch 84) used in the pad-dry-cure method. The coated cotton fabric was dried at 80 degree Celsius for 20 min. In order to compare the uncoated and nanocomposites coated cotton fabric. Above the similar process did for another two different calcined ZnO nanoparticles (4:300 and 6:600 degree Celsius). Obtained better ZnO nanoparticles by Vicoa Indica leaf extract and high-temperature calcined ZnO particles with different plant concentration has totally differed and good crystal structure than other techniques. ZnO structure morphology and particle size slightly influence in textile and antibacterial activities. The disc loaded of ZnO nanoparticles maximum zone of inhibition against E. coli and S. aureus bacteria at a concentration of 100 mg/ml in 600 degree Celsius and higher rate UV restriction than low calcined ZnO nanocomposites on cotton fabrics. SEM and TEM given clear evidence of high-temperature calcined ZnO particles has a uniform and spherical morphology than low-temperature calcined ZnO particles. The XRD given the clear victim of ZnO nanoparticles crystallites size was increased with increasing the temperature. S. Hiremath, C. Vidya, M. A. Lourdu Antonyraj, M. N. Chandraprabha, P. Gandhi, A. Jain and K. Anand, Biosynthesis of ZnO nanoparticles assisted by Euphorbia tirucalli (Pencil Cactus), Int J Current Eng Technol. 1 (2013) 176-179. Y. Abboud, T. Saffaj, A. Chagraoui, A. El Bouari, K. Brouzi, O. Tanane, B. Ihssane, Biosynthesis, characterization and antimicrobial activity of copper oxide nanoparticles (CONPs) produced using brown alga extract (Bifurcaria bifurcata), Appl Nanosci. 4 (2014) 571-576. P. Sutradhar, M. Saha and D. Maiti, Microwave synthesis of copper oxide nanoparticles using tea leaf and coffee powder extracts and its antibacterial activity, J. Nanostruct. Chem. 4 (2014) 86-91. P. Mohanpuria, N. K. Rana, S. K. Yadav, Biosynthesis of nanoparticles: technological concepts and future applications, J. Nanopart. Res. 10 (2008) 507-517. M. Pattanayak, P. L. Nayak, Eco-friendly green synthesis of iron nanoparticles from various plants and spices extract, Int. J. Pl.An and Env.Sci. 3 (2013) 68-78. A. Iyer, S. Panchal, H. Poudyal and L. Brown, Potential health benefits of Indian species in the symptoms of the metabolic syndrome: a review, Indian. J. Biochem. Biophys. 46 (2009) 467-481. R. S. Varma, G.E. Hoag, J. B. Collins, J. L. Holcomb, J. R. Hoag,M. N. Nadagouda, Degradation of bromothymol blue by ‘greener’ nano-scale zero-valent iron synthesized using tea polyphenols. J. Mater Chem. 19 (2009) 8671–8677. Q. Sun, X. Cia, J. Li, M. Zheng, Z. Chen, C. P. Yu, Green synthesis of silver nanoparticles using tea leaf extract and evaluation of their stability and antibacterial activity, Colloids. Surf. A. 444 (2014) 226-231. N. A. Begum, S. Mondal, S. Basu, R. A. Laskar, D. Mandal, Biogenic synthesis of Au and Ag nanoparticles using aqueous solutions of Black Tea leaf extracts, Colloids. Surf. B. 80 (2009) 113-118. M. N. Nadagouda, R. S. Varma, Green synthesis of silver and palladium nanoparticles at room temperature using coffee and tea extract, Green. Chem. 10 (2008) 859-862. V. Smuleac, R. Varma, S. Sikdar and D. Bhattacharyya, Green synthesis of Fe and Fe/Pd bimetallic nanoparticle in membranes for reductive degradation of chlorinated organic, J. Membr. Sci. 379 (2011) 131-137. M. N. Nadagouda, A. B. Castle, R. C. Murdock, S. M. Hussain, R. S. Varma, In Vitro Biocompatibility of Nanoscale Zerovalent Iron Particles (NZVI) Synthesized using tea polyphenols, Green. Chem. 12 (2010) 114-122. F. Asmaa, M. Shaaban, U. Mathias, T. Torsten, ZnO nanoparticles-chitosan composite as an antibacterial finish for textiles, Int. J. Carbohydr. Chem. (2012) 8. B. Venkatrajah, V. Vanitha Malathy, B. Elayarajah, Mohan, R. Rajendren R. Rammohan, Biopolymer and Bletillastriata., Herbal Extract Coated Cotton Gauze preparation for Wound Healing, J. Med. Sci. 12 (2012) 148–160.